Americans were not swayed very much by President Bush's speech Wednesday night outlining his new strategy for the war in Iraq, according to a CBS News poll. Half of those who saw the speech said they disapprove of the president's proposals in general, while 37 percent said they approve. Only a third of those who saw the speech (and a third of all Americans) said they support Mr. Bush's call for sending more than 20,000 additional troops to Iraq; about six in ten said they oppose the troop buildup. More than 70 percent of Americans think he should have to get congressional approval before he commits those troops. However, three in 10 Americans said they now approve of increasing troop numbers overall – an increase of 10 points since last week. The number that favors reducing troop strength or withdrawing from Iraq altogether dropped from 57 percent to 46 percent. Americans disapprove of the president's proposal to fund a large-scale jobs and reconstruction program in Iraq, although speech watchers were more open to that. 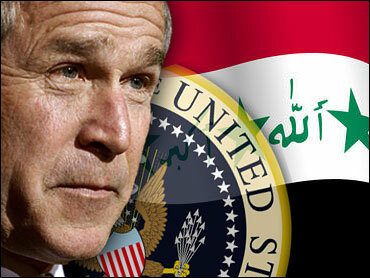 The speech also did little to allay Americans' misgivings about Mr. Bush's handling of the war. Following the speech, 68 percent – the same number as before the speech – said they were uneasy about his ability to make decisions about Iraq. Just 28 percent said they were confident in his handling of Iraq – about the same number as before the speech. Americans remain extremely skeptical about whether or not the U.S. can succeed in Iraq. Just about half overall say U.S. success is not very or not at all likely. Speech watchers are a bit more optimistic. There's also skepticism about the Iraqi government's willingness to take the lead in stopping the country's violence, as well as doubts that Iraq will ever become a stable democracy. Slightly more than half now say Iraq will someday become a stable democracy, a small jump from a week ago. But just 3 percent say that will happen in the next year or two. About a third of all Americans saw the president's speech. Democrats, Republicans and Independents were equally likely to have seen it. Interviews were conducted among 458 adults by telephone on January 10, 2007, after the President's speech. These respondents were originally interviewed in a CBS News Poll conducted January 1-3, 2007. The error due to sampling for results based on the entire sample could be plus or minus five percentage points.